This is a guest post by Fazal Mayar. If you want to guest post on this blog, check out the guidelines here. Twitter has emerged as a major social media platform in recent years. Several companies are now focusing on their twitter accounts to market their products or services. A majority of tweets are just for self promotion purposes but a few companies and individuals have succeeded in attracting a large number of followers which is beneficial for their personal brands and businesses. People who post only self-promotional or uninteresting tweets fail to attract people to follow them. If you are serious about gaining followers on Twitter you have to post tweets which are valuable and interesting for others. Before you post a tweet, think about the target audience and whether or not they are likely to respond to you Tweet. It’s Ok to tweet about yourself occasionally but remember to make it interesting. Your followers should never feel that your tweets are just as boring and useless as some of the tweets by other users. When your tweets are a mixture of interactive and interesting messages, interesting external links and witty responses to other people’s tweets you would enhance your chances of getting more and more twitter followers. 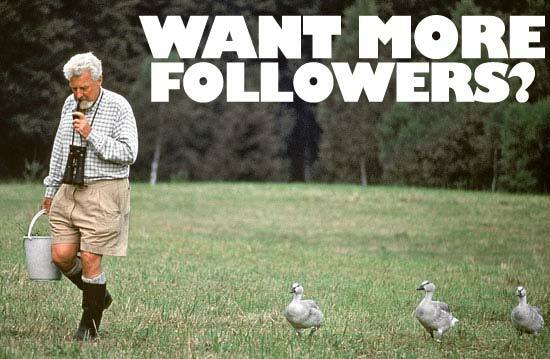 You should regularly interact with your followers which also improves your chances of increasing twitter followers. Some of the best ways to interact is to reply to other people’s tweets or by retweeting. Interacting with your followers regularly is a great way to gain and maintain twitter followers. Twitter is not just a platform to post self promotional tweets and you should try and get involved in the community. You should also abstain from following other twitter users in a hope of being followed back. Similarly avoid using any software or program which promises to get you tons of Twitter followers with almost no work on your part. Twitter is a wonderful social platform to enhance your personal or brand image. You can certainly increase your twitter followers but you need to take the right approach and apply the suitable techniques to be successful. Remember, much like life there are no ways to achieve instant success on Twitter. You need to provide value to the community and be interactive and interesting with your tweets to slowly increase your twitter followers. Fazal Mayar is a young blogger that mainly teaches how to make money online. Subscribe to his blog’s RSS FEED for more great posts. Nice tips.. Have many followers on twitter can be used to redirect heavy traffic to your website..! Tips are simple and neat, very informative post………. Thanks for your kind reply to our post..
By Being Active and Interactive in Twitter we can gain Lot of targeted followers on twitter easily. Thanks for the advice, still new to Twitter and trying to strike right balance between types of tweet and keeping it not too self-promotional. Good thing is that the more time you put into it (following these sort of tips) the more you will get out of it. good article. here is a free website you might want to try increase your followers. Yes, perfectly said that Twitter should never be used for self promotion only. Actually this practice always fails when someone use twitter for self promotion. Twitter community is somewhat like members of our local society and close friends in our real life. And you must agree that no one likes a person who is constantly saying about his/ her own. It sounds awkward. You should say about your own along with lots of other informative talks going round the world that interests your peers and also listen to them. Nice information to increase follower on twitter in effective way. Looking forward for your upcoming post. short,simple and effective tips ….thanks for sharing.